This entry was posted on Thursday, July 9th, 2015 by Frances Ryan. 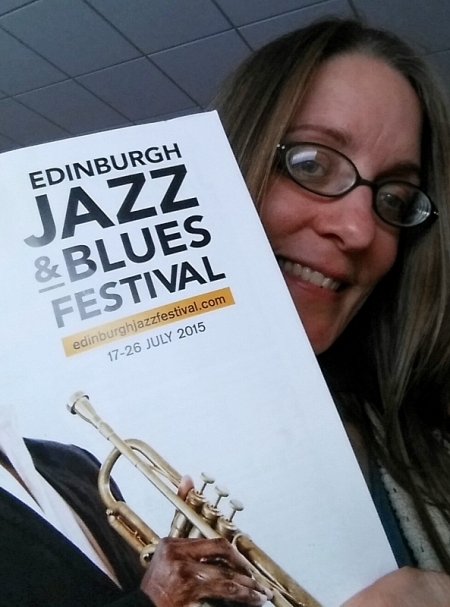 As part of my plan to have more adventures—even if I have to have them alone—I picked up a programme for the Edinburgh Jazz and Blues Festival. And I’ve marked some gigs I’m interested in attending. And I even added them to my calendar. Now, I just need to find the courage to actually go to the various shows on my own. Of course, I am a poor student living on a budget. And that means I can’t really afford to go to all of the shows I want to see. It also means that I have to pick my shows based on ticket price. But that means that I am going to try to see a couple of artists I might not ordinarily see. I’ve decided to only see shows that are included in the student standby listing. Those are shows that I can get tickets for just £5. But tickets are only available starting 30 minutes before the show. There is a risk that I won’t get a ticket, but there is a chance I will find my way into the venue at bargain-basement prices. I’m also going to take advantage of the two free events taking place the first weekend. There will be a Mardi Gras celebration on the Saturday followed by a carnival and parade on the Sunday. Both sound like fun events and I’m hoping the crowds will help me feel less awkward about being alone. Yes, I wish I had someone to go to the gigs with me. And maybe someone will join me for a show or two, which would be nice. But I have to realise that I am just Frances now; not Frances and. I also have to realise that if I want to meet someone to be my and, I have to get out of the house. It happened once, it could happen again. Stay tuned to find out how my jazz plans turn out!